Traveling to the North East for your next vacation? This list of exquisite North-Eastern homestays might tempt you to ditch the soulless luxury of hotels and give homestays a try. Ziro Valley, a 4-hour car journey from Itanagar, is getting increasingly popular among adventurers and travelers, mostly for the local tribal people with intricately tattooed faces, and of course, the Ziro Festival of Music. If you're planning to visit, how about you fix your accommodation at Punyo and Kaka's home? Their home is built in the traditional Apatani style and is surrounded by the couple's beautiful vegetable garden. Not just a comfortable stay, you can also expect the hosts to pamper you with delicious home-cooked local food and conversation. A night’s stay will set you back by INR 2,400 for two, including breakfast and dinner. If you're looking for a homestay around Sikkim, the old-worldly charm of the Chalamthang Homestay is sure to win your heart. 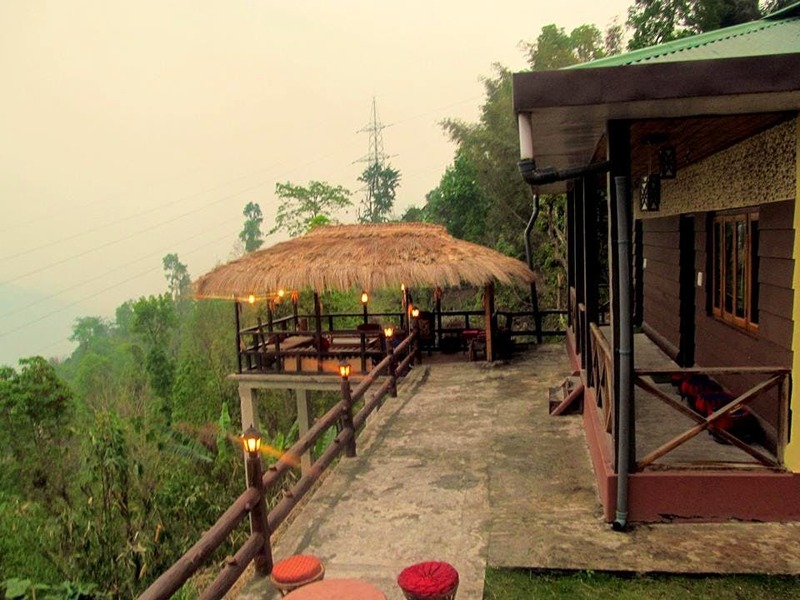 You'll be stunned by the views that this bungalow offers - think sunrise amidst snow-capped mountains and the cascading Teesta river. There is a separate outdoor dining area with a thatched roof that overlooks this beautiful scenery. The bedrooms are spacious and comfy, and the wooden flooring adds just the perfect rustic touch to the ambiance. Add to that the cardamom gardens around the house, and you have the perfect hill station acco. You can pick vegetables from the garden adjacent to the bungalow and whip up a dish for yourself! A double-bed room will set you back by INR 1,200 while food will cost you INR 350 per head, including dinner and breakfast, and evening tea with traditional snacks. Why stay in a drab hotel when you can make your way into a colonial farmhouse? Aerodene Cottage is a very charming restored 60-year-old home built in tradition Assam style, with wood panels and bamboo plastered walls. Think of it as a boutique guest house with both heritage and modern amenities to boast of. The cottage is surrounded by a garden with plenty of private nooks and corners where you can perch yourself with a book or a cup of coffee and just rest in the stillness of the ambiance. They also have a spa and a wellness center where you can do yoga and meditation and truly rejuvenate yourself. The rooms exude some of the luxury of a five-star hotel - think handcrafted beds, parquet flooring, 22" LCD television sets with cable connection et al. And all this, in one of the prime locations in Shillong. Double rooms at the Aerodene Cottage start from INR 3,960 per night. A one-hour drive from Shillong in the right direction might land you in Lawbah Village, Meghalaya. You might find yourself on top of a hill, amidst a Protected Community Forest - however, don't be startled because that's where the Mawlyngbna Travellers Nest is. This homestay is a blessing for the outdoorsy and the adventurous, for it has plenty of things to keep you busy. Local Khasi food, of course, is one of the many attractions, but you can also go about trekking, kayaking, canoeing and hunting for indigenous fossils. A short walk to the west of the area where the fossils are found takes you unsuspectingly into the grounds of a fabled animal market place – Ka Iew Luri Lura, where the rock formations resemble the footprints of animals. You can also go fishing in the Umkakhoi River nearby. The log cabins might a squeeze, but the surrounding exotica is sure to leave you rejuvenated. If you're in Guwahati, you can ditch the hotel for a stay at this creaky antique Assamese style mansion. It has been renovated and restored of course, and even though it might not literally be 'creaky', but it surely will overwhelm you with its romantic period charm. The first floor houses six sprawling suites with all the luxuries of a five-star with walk-in wardrobes, air conditioners, and bathtubs. There's no lack of greenery - you can take your pick from the many gardens and lawns that are in and around the mansion (there's one even on the terrace!). And if you want some fresh air, the promenade along the Brahmaputra river is just around the corner. Thanks to the in-house chef, you can get scrumptious home-cooked local food at your beck and call. A stone's throw away from the local markets, post office, railway station and banks, Baruah House will set you back by INR 2,500 onwards for a double room.